As you read this title in your mind, you are probably pronouncing the word "clothes" in the typical American fashion, but here it is pronounced "clothe-ez." As you can see Esther and I have new clothes. The staff at GSF all made contributions around Christmas time to give gifts to the missionaries here. I was given this material and told that the tailor would make a skirt and shirt for me and Esther with the material. After I returned from the US, we took measurements and discussed the plans. There are not patterns or anything here, but we just talked about common designs here. Now that they are finished, Esther and I are wearing them to church today! 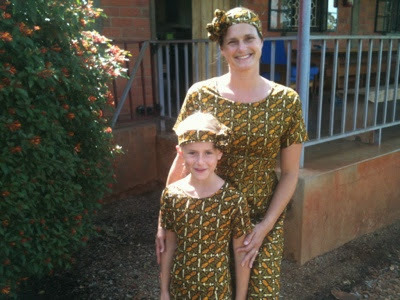 I thought you might enjoy seeing this photo of our Ugandan clothes. I'd say your tailor did a pretty darn good job!! They look great.